Nikki Cornfield is one of the Parfitt-Pascoe Writing Residents 2018. She is a British expat, yoga and meditation teacher, currently living in Australia. She blogs at https://nikkicornfield.com/. We thank her for this great article. 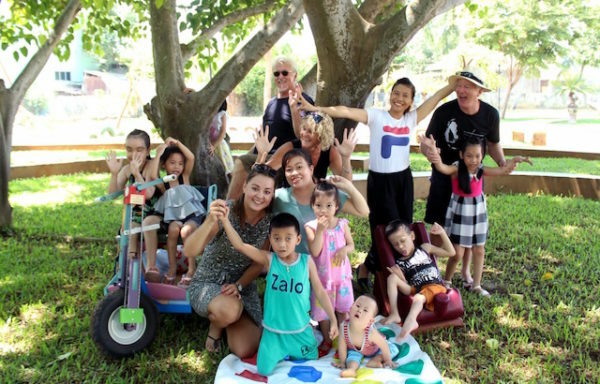 We knew we would be meeting children whose problems and disabilities would stab at our hearts; in Vietnam children with special needs are deemed ‘useless’ to their families as they cannot work or go to school to learn. But as we sat and played with them, their smiles demonstrated that these were the lucky ones: they stood a chance of having an education and a future thanks to Jeanne and the volunteers who came from all over the world to offer specialized care. Jeanne introduced herself to our group of five adults and ten children and spoke about the work that CHIA does, not just in the center but also in the community. As the children crawled into our laps for a cuddle or to show us a toy we all melted at the love we immediately felt for them. We were all moved to tears at the stories of just how difficult it is in Vietnam for families to survive and feed their children, let alone educate them. We were humbled at how much we have at home in comparison. 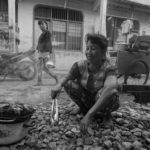 In Central Vietnam’s Quang Nam province families are directly responsible for the total cost of sending their child to school. With most families surviving on less than $2 per day – yes that’s less than your average take away coffee -, it is easy to see that school fees and supplies are so huge that this large financial burden becomes unsustainable and children have to quit school. They are forced to work at an early age to help their family. Jeanne explained to us that if the child has learning and/or physical disabilities they cannot do this which leaves them abandoned at home, of no use to their families or society. I don’t think there was a dry eye in the room at this stage.